(Al Hartmann | The Salt Lake Tribune) Longtime Utah farmer Alan Bangerter stands in front of a 23-acre field where he grows vegetables. Farmington want to take 11 acres of the land for a city park with soccer fields. Farmington • If Alan Bangerter loses land, he loses his livelihood and his ability to grow and sell fresh green beans, sweet corn and other vegetables at grocery stores and farmers markets along the Wasatch Front. 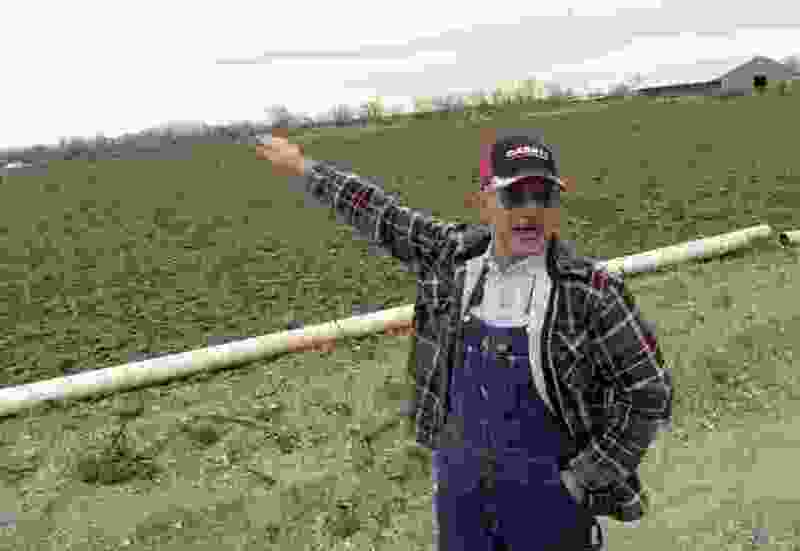 The sixth-generation farmer says that’s why he is fighting Farmington, which wants to buy 11 acres of his farmland for a city park with soccer fields through an eminent domain process. 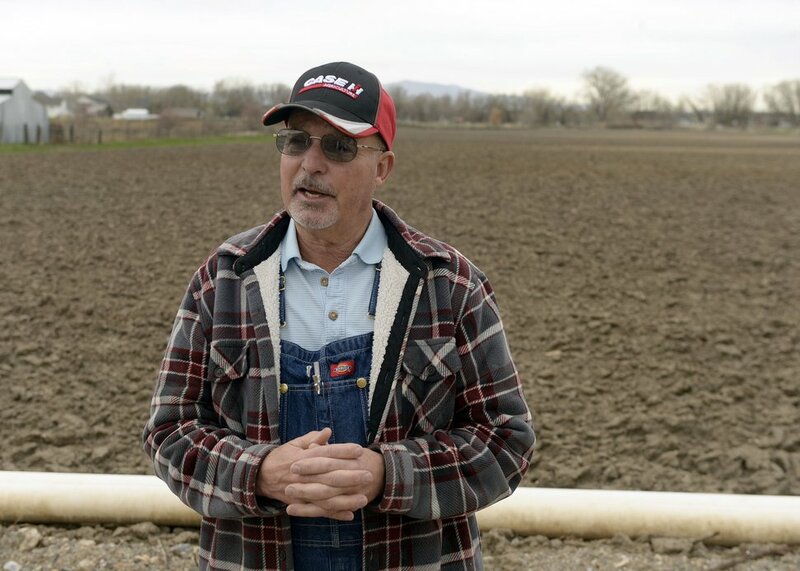 Bangerter contends there are other parcels where soccer fields could be placed without harming “a productive farm” and is seeking to save his property as an Utah Agricultural Protection Area (APA). He is awaiting a public hearing, which will be held May 1 during the Farmington City Council meeting. An APA designation would protect the property from any future zoning changes and local governments could not exercise the right of eminent domain without exhausting other possible remedies, said Bangerter’s attorney Randall Edwards. An APA — which is good for 20 years and can be renewed — also protects farmers and ranchers from nuisance lawsuits from neighbors who move in and later claim the farm is too noisy or foul-smelling (usually when there are chickens or other animals). Bangerter is gathering signatures of support through an online petition at MoveOn.org. He already has more than 4,300 signatures, including many customers who frequent farmers markets in Salt Lake City and Bountiful. “I want to keep farming,” the 67-year-old Bangerter said Monday, noting that after he retires, his children and grandchildren are interested in continuing the family business — officially named Chas W. Bangerter & Sons Inc., after his father, Charlie. The Downtown Alliance, which runs the farmers market in Salt Lake City’s Pioneer Park during the summer season, is one of several food groups promoting the Bangerter petition drive. The problems for Bangerter began last October when the Utah Department of Transportation and the Federal Highway Administration finalized the route for the West Davis Corridor — a 19-mile freeway heading northwest from Legacy Parkway through Davis and Weber counties. To build the road, UDOT will take about 8 acres of Bangerter farmland as well as an adjacent 11-acre park — with soccer fields — owned by Farmington. Both properties are near 1100 West and Glover Lane. While UDOT will pay Bangerter for his property, the state must replace the city park with another one of equal size somewhere else in the city. Farmington officials have told UDOT that their preferred site is 11 acres of a 23-acre plot that Bangerter owns at 650 West and about 500 South. Millheim said the city is sympathetic to the situation. He said the city is in a Catch-22, because no matter where the fields are relocated, a property owner is going to be upset. Bangerter said his fight is with Farmington. “I don’t have an issue with UDOT,” even though it’s not the first time the agency has taken his land to build a road. Two decades ago, UDOT took some farmland to build the Legacy Highway. “The money we got from that land, we used to buy this property,” he said of the parcel Farmington wants. Bangerter said it took about five years to level, prep the soil and install a water system so the property could be farmed. Today, it’s one of several plots — totaling nearly 90 acres — that Bangerter farms in Bountiful and Farmington. The company pays about $400,000 in annual wages — a large portion to some 100 Davis County teenagers, who help plant, weed and harvest vegetables during the growing season. “At the height of production, we average about two semi-trucks a day of fresh produce,” said Bangerter, whose family has been farming since 1902, when great-grandfather Nicklas started growing vegetables in Bountiful.